The BAGSC Blog replaces our quarterly newsletter. The advantage of our blog is that it allows us to really be a community — our members can comment and discuss articles; contribute stories and reviews; and let other members know about “calls for entries”, galleries, openings, and learning opportunities. Only ten articles show up in the main window at a time. After that, the information is automatically archived by date and by the categories on the left side. Click on each category name to see all of the articles in that category. You can also search by any keywords you remember. The articles will always be in the archives; you’ll be able to go back and find previous information. Please explore the categories to make sure you don’t miss anything. If you click on the images, they’ll open in a new window at a larger size. This may take a little while if you have a slower connection. Everyone can comment. Simply press the “No Comment” or “# Comment” link under the headline of the article (it will change depending on whether or not there are already comments). You’ll be taken to the bottom of the page. Enter your name (first name, or first initial and last name — all are fine) and your email address and write your comment in the box. (You can put in a web address if you have one, but it’s not necessary.) Click “Submit”. It’s that easy. You won’t see your comment posted right away. In order to prevent SPAM, your comment will be sent to the Blog Administrators. Several times a week, we’ll go up and review/post the comments. Please be aware that comments may be edited for appropriateness or information. At the top of the blog (right under the name) and the bottom is a “Subscribe to Feed” link. There’s also an “Entries RSS” and a “Comments RSS” under the Meta category in the left hand navigation bar. Clicking on these will let your browser alert you when something new is posted. Articles, news and information will be added as soon as any member posts it, so it’s good to visit often. Don’t worry — you won’t be bombarded with emails. Each time a new article is posted to the blog, you’ll receive an email with the article and pictures, only once each day. If no articles are posted, you won’t receive anything. If four articles are posted, you’ll get all four in one email. Of course, if you ever want to look up something that has been posted before (including the whole time the blog has been in existence) you can always go the the BAGSC blog address and search for what you want. 1. On BAGSC News blog, look down to the bottom of the left-hand column and find and click on the link “Subscribe to BAGSC News by Email”. You may have to scroll down to see it. Click on the words "Subscribe to email" found at the bottom of the left column. 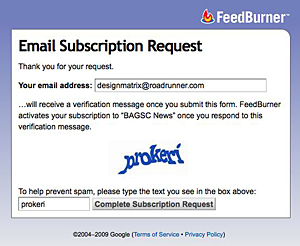 After you type the anti-spam text in the box provided, click on the “Complete Subscription Request” button. 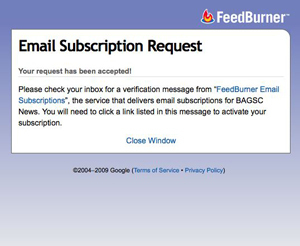 This window will ask you to check your email inbox for an email from Feedburner Email Subscriptions with a link. This is one more safety to prevent SPAM. Inside that email will be a link for you to click. Once you follow the easy instructions in the email, you’ll get a window that says your email subscription has been confirmed! Now the BAGSC blog will come directly to your email inbox whenever a new article has been posted. We’re looking for lots of contributors to the blog. It’s part of the fun. Posting articles and pictures are as easy as using your email. We’ll show you how. Scroll way down on this page to the section How to Post to BAGSC News as a Contributor, follow the instructions and we’ll get you set up and blogging in no time. If you want to contribute information or articles, but don’t want to blog yourself, feel free to email your article and/or images to Deb and we’ll post them for you. We’ll be rotating the header artwork as we can, to highlight a different member. To submit your artwork for consideration email your artwork image and a bio to (you guessed it) Deb. Your artwork should be 720 pixels wide x 180 pixels tall at 72 dpi in RGB color mode. If you only have high res scans, and need help prepping the artwork, let us know and we’ll be happy to help. No worries. We’ll periodically print out the blog and mail it to you. Signing up as a contributor looks a little cumbersome, but, once you go through the steps, blogging is really easy. Once you’ve signed up, you’ll automatically be a contributor for the BAGSC blog. 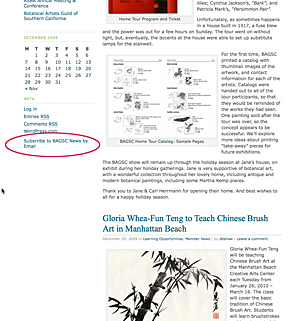 Go to the BAGSC News blog and log in: click on “Log In” under the META header on the left hand side and enter your user name and password that you created on your WordPress.com invite page. You’ll now see a blue bar across the top of the blog, right above the header image. Towards the left side, click on the words “New Post”. This will bring you to the new post window. Click in the box under the word “Title” and enter the title of your post. Then click in the box below, under the word “Post” and start typing your article. If you want to compose your article in Word or a text-editing program, you can copy and paste the body of the article into this box. To the right of your posting area is a box labeled “Categories”. Only ten articles show in the main viewing area at a time, the most recent on top. Articles that move off the bottom of the page get archived in the category sections to the left of the posting area. By selecting a category, you designate which category your article will go to. If you don’t designate a category, the blog administrators will do that for you. Hit the “SAVE” button under your post. You won’t be able to see your article posted right away. Once you’ve written and saved your article in the blog posting area, the blog administrators will check it to make sure all the code is correct (and nothing will look funny), edit if necessary and then publish. It’s easy! Images should be saved as a 72 dpi .jpg file, with the extension as part of the file name, and no more than 450 pixels wide. In your article, click the cursor where you want the image to appear in the article. Under the “Post” box is an “Upload” area. Click on the “Browse” button and locate your image file on your computer. Click the image file and then click “Open”. Put a title in the title area and write an optional short description in the “Description” box. Click the “Upload” button. When your image finishes uploading, make sure that “Thumbnail” and “Link to: File” are selected. Then hit the “Send to Editor” button to send the image to the post you’ve created. Be sure to hit the “Save” button under your post again. If you need help with an image, email the image to Deb and the Blog Administrator will handle it for you. thanks . the post are very useful . Friday, April 4, 7pm, through Sunday, April 6, 3pm. Looks good for all those interested in California natives.